Alonzo King's LINES Ballet brings a new work, and a revised one, to Pittsburgh. Fluidity, line, elegance: LINES Ballet dancers Meredith Webster and Keelan Whitmore. To many choreographers, even a dance work that is "done" is never truly complete. There are always changes to be made to accommodate different performers, or revisions for clarity. Such is the case with San Francisco-based choreographer Alonzo King and his Signs and Wonders. Originally commissioned and performed by Dance Theatre of Harlem in 1995, the piece takes on new life this season as King has revamped it for his LINES Ballet. Signs and Wonders now includes inspirations gleaned from a 2008 trip to Arba Minch, Ethiopia, and its annual Festival of a Thousand Stars. LINES Ballet performs the revamped Signs and Wonders, along with King's latest work, Refractions, at the August Wilson Center on Jan. 15 and 16. The Festival of a Thousand Stars celebrates the traditional song and dance of the tribes of Southern Ethiopia. By phone from San Francisco, King says the experience gave him a powerful reminder of what dancers from around the world have in common. "I see things the same [as you]: Although this may look different, we have the same goals. The ballerina has the [same] goal as the dancer in central Africa: transcendence. They want to get beyond the body and away from common thought. What affects me every time when I look at primordial dance is that presently we are doing the same thing, [have] the same goals, because it is humanity." The nine-section, 30-minute Signs and Wonders is set to indigenous music and song from several African tribes, including lullabies, lament and labor songs. The work seeks transcendence for both dancer and audience via its music and King's signature contemporary-ballet movement language -- a language of fluidity, line and flamingo-like elegance. "The function of music is to lift the spirit," says King. "There are tones that can affect your mentality. In primordial cultures, what we call the art of music and dance is affecting change within the individual and the environment." The New York Times said that Signs and Wonders "remains unpredictable and inventive, right up to its dazzling, fast-moving finale." Founded in 1982, the award-winning LINES has been at the forefront of contemporary ballet in the U.S. Like other ballet troupes, the company is rooted in classical ballet technique. But it has moved beyond that form to express an eclectic vision of the art, one arising from King's mind and soul. 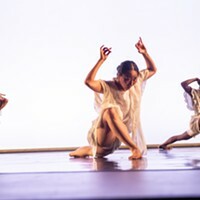 In Refractions, which the company premiered in San Francisco this past October, King provides a departure of sorts from his usual stylistic emphasis on his dancers' legs by shifting the focus to their arms and upper torsos. 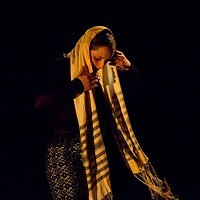 The 11-section, 35-minute work for nine dancers is set to original music by New York jazz pianist/composer Jason Moran. It features chains of dancers twisting and turning, only to come apart and form new images that are (per the title) refractions of the former. Of Refractions, Liz Hafalia of the San Francisco Chronicle wrote, "There is less of the feeling of a code or formula than meditation. As with Moran's score, King seems to be pulling his structures apart and re-examining them." For King, the program in Pittsburgh perhaps represents more than a re-examination of his choreography. It also suggests a reexamination of his art -- one that borrows from his memories to create different ways of looking at life through dance.